Published by Cyril Huze May 13th, 2016	in Customs, Editorial and Merchandise. Unbreakable denim? 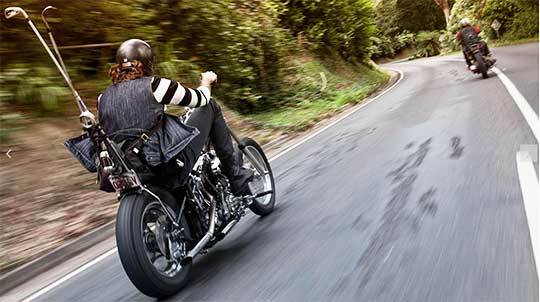 It’s true that the most well known fabric may not stand up the abuse of a biker on the road. 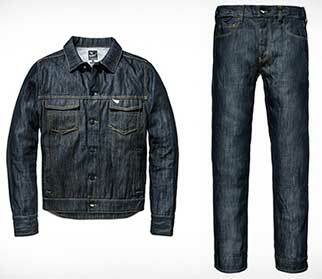 What about a denim certified 133 times tougher than the standard denim? A toughness coming from a space age material from the space age known as UHMWPE or Dyneema® offering 360º torsional strength, motorcycle tested impact, burst and abrasion resilience (15 times more than carbon steel). A different ballistic fibre not only strong but super light. It’s all-day-wearable, retaining shape through your wash and dry cycle and will never shrink. But not cheap… Saint Unbreakable Denim. I would like to have some better denim riding jeans, but at $600 bones, that is ridiculous. For the first time in 40 years I got to test some armored jeans last July and they only cost me $88 bucks at Cycle Gear. The result was impressive, as they only went through the first layer in a small spot on my knee. I think I will stick to a more affordable jean, or just wear my Langlitz leather jeans. What’s up with these wanna be authentic guys wearing 600 plus dollar clothes. I guess they are looking for a certain Demographic, like Brad Pitt, Norman Reedus, and David Beckham type people. I’m sure under Bernie-Care if you can’t afford nice things, you’ll be able to have a doctor write you a prescription to get them paid for by your neighbors. I don’t understand the venomous attitude towards things currently available only to the successful. Just because I can’t afford a Bugatti Veyron doesn’t mean those who can are rotten bastards. Posers buy a look, motorcyclists buy function. I’m all about wearing clothes that help me live to ride another day. At 600 bones these are a bit rich for me, for now I’ll stick with kevlar lined jeans. But I hope the tech finds an audience which brings the price down. Hell yeah. I paid over $600 for a pair of Wesco boots and it was well worth the money. While these jeans are too rich for me I would love to have a pair. I don’t mind the price, but damn- I can’t get them in a style other than that stupid “skinny” jeans??? Sorry, I’ll stick with my “Dad” jeans.